Taking a short breather from the whirlwind week I’ve had lately, and trying to catch up on some blog posts while the Chinese Internet wall seem to be temporarily down! Out of all the wham, bam holiday collections currently flooding my feed; I would like us to take a moment and focus on pure grace… the elegance and ease of Kanebo’s A/W 2017 color collection. This is an extensive collection, including both new base products and seasonal colors. I always gravitate towards eyeshadows like a moth to flame, but as I am typing this, I am sorely reminded that I had forgotten to pack a lip balm on this trip, and really craving these Kanebo lip treats. Kanebo Lip Primer is a sheer pink-tinted balm that is formulated with botanical oils to pamper and moisturize. Against my rather dark lips, it does not seem to lend any color, which makes it perfect for layering with other lip colors. It does not have too much slip that it causes lipsticks to migrate and transfer. What it does well is to prep my lips and prevent them from drying out. This season, Kanebo has also released a brand new range of Kanebo Intense Crayon Rouge. These come in slim twist-up tubes reminiscent of the Dior and Cle de Peau ones. For fans of those brands, you may be excited to know that Kanebo’s offering is just as good if not better! These Intense Crayon Rouges pack a good dose of color pigments while retaining a comfortable silky feel against the lips. The finish is described as a “soft matte”, but on me there is a lovely sheen that gives a lustrous look. There are 6 shades to choose from, and I have swatched 3 of them above. 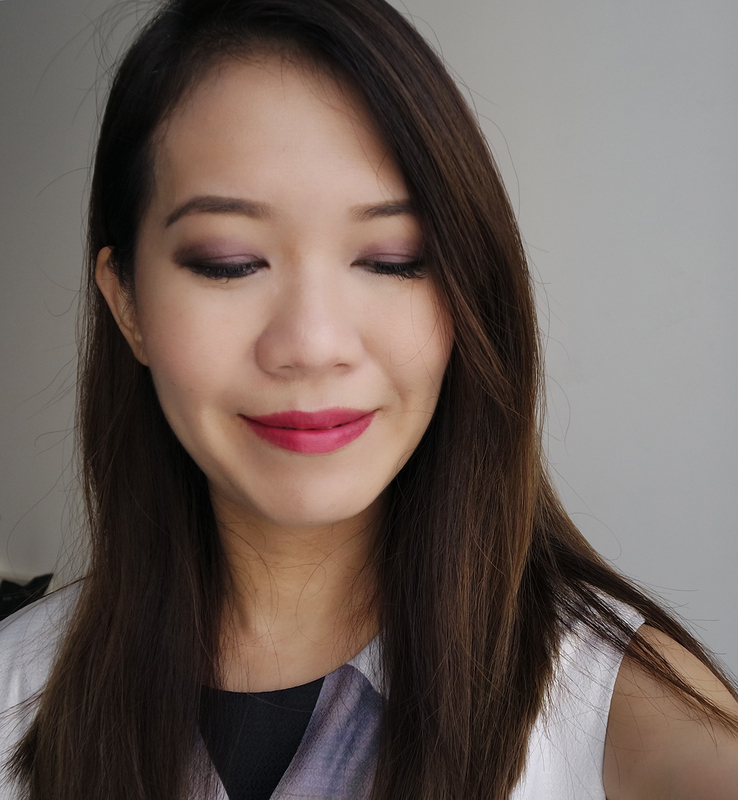 Purple eyeshadows always give me a delightful thrill, and Kanebo’s Selection Colors Eyeshadow in Elegant Lavender is certainly no exception! In general, Kanebo’s eyeshadow is incredibly finely milled, goes on smoothly and is a dream to blend. The 5 shades in the palette are perfectly balanced and complement each other so well you’d be hard-pressed to get them wrong. Pigmentation of this palette is good for Japanese makeup, and the colors are not brightly intense, but these undertones flatter more mature Asian skin tones well. For this eye look above, I started with the light greyish lavender all over my lid, followed by medium purple on the outer half. Thereafter I used a little of the dark brown to define the outer corner, and dabbed a bit of the shimmery pale lavender to the middle of the lid. I also lined the outer half of my upper and lower lash line with black liner, smudging the lower one out with the dark brown eyeshadow, and finished with a pop of the frosted white in the inner corner. Before you show you the final look, I’d like to introduce a couple of mascaras from Kanebo that help to finish the look. The Kanebo Volume Framing Mascara has a nice fluffy applicator wand that has thin and relatively short bristles to grab and coat my short Asian lashes without fear of jabbing my eyeballs. The formula is thin and does not clump, and more importantly, it is waterproof and smudgeproof! The Kanebo Eyebrow Mascara has an interesting applicator where one side is shorter so you can get close to the front of the brows where the hairs are sparser (at least in my case), and longer on the other side so you can comb out the longer hairs towards the end of the brows. There are 2 shades to choose from, both with an ashy undertone to complement Asian skintones. Turning to my other fetish…Kanebo Luster Cream Foundation is a lovely cream that glides on almost like mousse and feels incredibly lightweight for a cream. It has good coverage, and can be easily sheered out with a dampened sponge if needed. The finish is very smooth and the foundation blurs the appearance of pores and other imperfections. I like how it brightens up my complexion, without being actually lighter than my actual skintone. 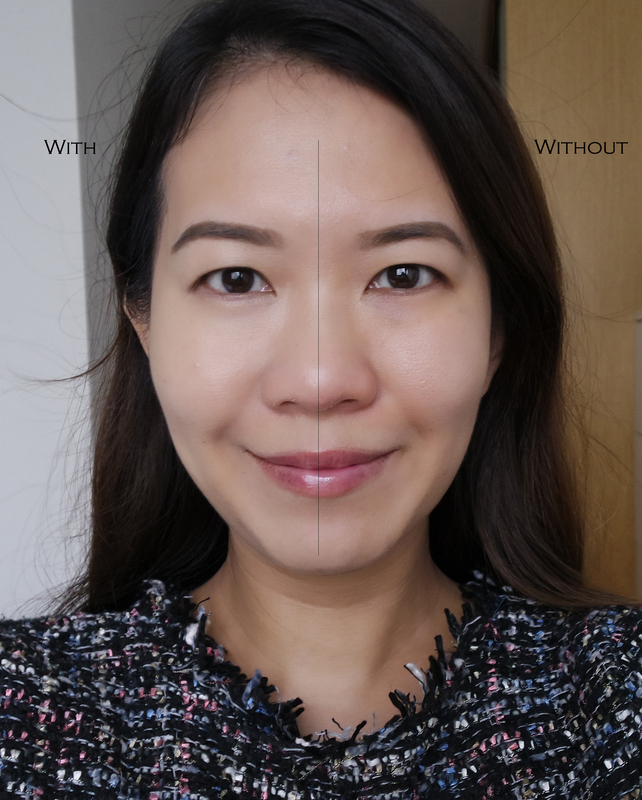 For a cream foundation, it has amazing longevity, lasting all day even in the intense heat that I’ve been experiencing in Singapore for the past few weeks. Feel free to click on the image to enlarge and zoom to your heart’s delights. There are 8 shades to choose from, 4 different intensities with 2 different undertones. Ochre is neutral yellow-based whilst pink ochre has a brightening pink tint. For your reference, I used Ochre-B in the comparison image above. And finally, here is a full makeup look featuring Kanebo Luster Cream Foundation as a base, Intense Lip Crayon Rouge Vibrant Fuchsia on my lips, Selection Colors Eyeshadow Elegant Lavender and Volume Framing Mascara in Deep Black on eyes, and Eyebrow Mascara in Neutral Brownish on brows. Everything always looks better when taken in context, don’t you think? I’m actually very pleased with this look! Kanebo’s A/W 2017 collection is available at counters in Isetan Scotts, Takashimaya Departmental Store, and OG People’s Park, Orchard Point and Albert Complex in Singapore.